Jonathan Williams and Kati Siconolfi – Our nomination for the worst tax policy idea of 2015 goes to Alaska Governor Bill Walker for his proposal to reestablish the state’s personal income tax. This proposal would turn back the clock 35 years on economic development in the state and would cause significant harm to Alaska’s economic outlook. Alaska faces a $3.5 billion budget gap due to declining oil prices and years of overspending. While there may be tough choices ahead to put Alaska on the path back to balanced budgets and a healthy economy, a personal income tax will only add to the fiscal challenges for Alaska’s hardworking taxpayers. Alaska’s lack of personal income tax status has earned the state an economic outlook ranking of 14thbest in the 2015 Rich States, Poor States ALEC-Laffer State Economic Competitiveness Index. According toRich States, Poor States, the nine states without a personal income tax significantly outperform the nine states with the highest personal income taxes in important measures of economic health. For example, from 2004 to 2014, the population in the states without a personal income tax grew 97 percent faster than their high tax counterparts. During the same period, job growth in the nine states without a personal income tax increased 106 percent greater. Even state and local tax revenue in the nine states without a personal income tax grew 54 percent faster. 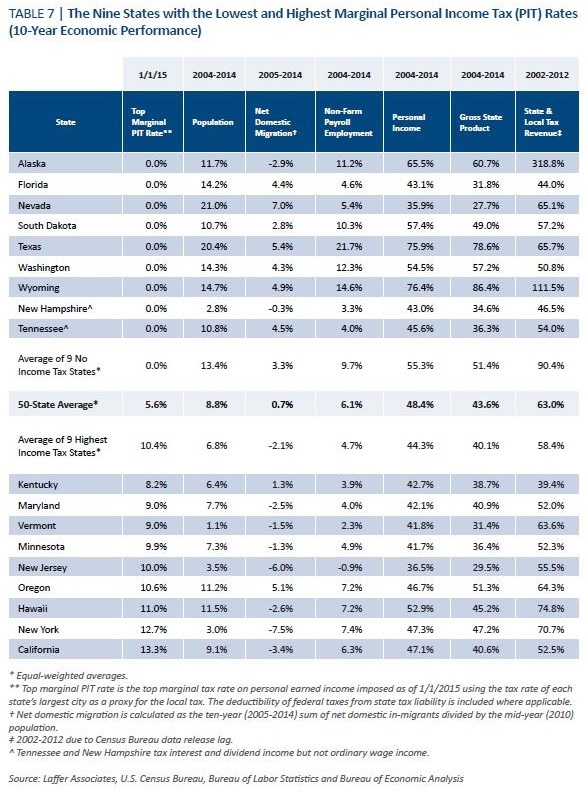 As the table demonstrates, Alaska’s hardworking taxpayers greatly benefit from the state’s avoidance of a personal income tax. Be the first to comment on "ALEC Calls Walker Budget “Worst Tax Policy Idea of 2015”"